The 115 islands of the Seychelles are located in the Indian Ocean, with the capital, Victoria, lying 1,500 kilometers off the coast of East Africa. Since the islands are just over 320 kilometers from the equator, they’re extremely warm and humid, with frequent tropical storms. To avoid the rain, visit around April, when you can enjoy perfectly dry heat. With a population of around 30,000 people, Victoria, located on the island of Mahé, is one of the world’s smallest capitals; however, there’s still plenty to see and do! If you’re looking to indulge in some retail therapy, look no further than the Central Market, where vendors sell fruit, vegetables, and souvenirs. Victoria is one of the world’s smallest capitals. Alternatively, check out the Victoria Botanical Garden to see exotic birds and other rare wildlife, such as giant tortoises. Travel a little further from the city (just five kilometers) to reach the St. Anne National Marine Park: with colorful reefs and over 150 species of marine wildlife, this is a popular destination among snorkelers and scuba divers. 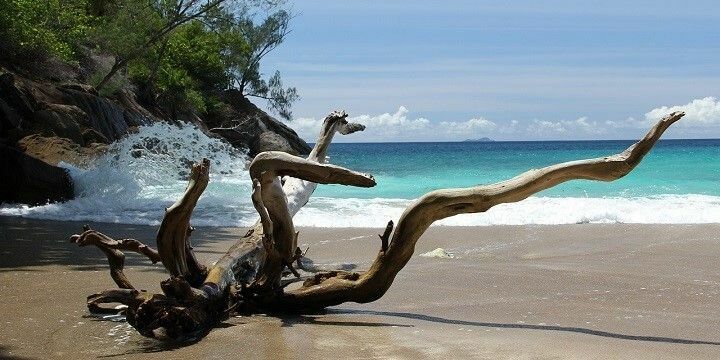 Mahé is most famous for its picturesque beaches, including Anse Major, Bai Lazare, and Beau Vallon Beach, which is well-known for its calm waters and incredible sunset views. Anse Major is just one of the many beautiful beaches in the Seychelles. 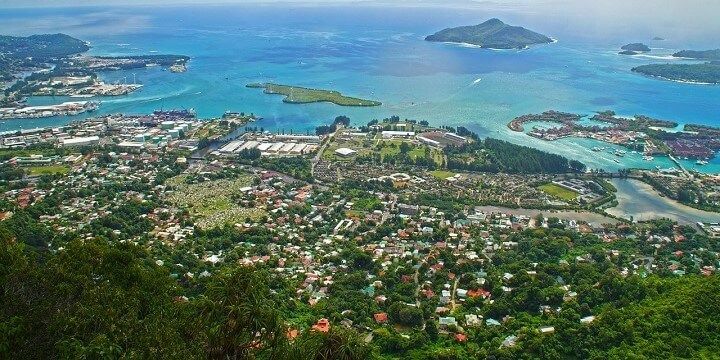 Head further inland to visit the Morne Seychellois National Park: in addition to rare wildlife, the park is also home to twelve hiking trails, covering 15 kilometers. If you’re feeling ambitious, take the trail up to the country’s highest peak, Morne Seychellois (905 m), for unbeatable views over the Seychelles. Check out southern Mahé to see incredible former plantations, where products such as sugar and coconuts were once grown. One of the most popular spots is Mahé’s Craft Village, where you can speak to local artists, get a free tour around the plantation, and buy unique souvenirs. Afterwards, take a tour around the Takamaka Rum Distillery, also located on a former plantation, which includes delicious tastings. Take a one-hour ferry ride from Mahé to reach Praslin Island. Its most popular tourist attraction is the Valée de Mai, a national park and UNESCO world heritage site. The park is home to the Coco de Mer, one of the rarest palm trees on Earth, which produces the largest nuts in the world. 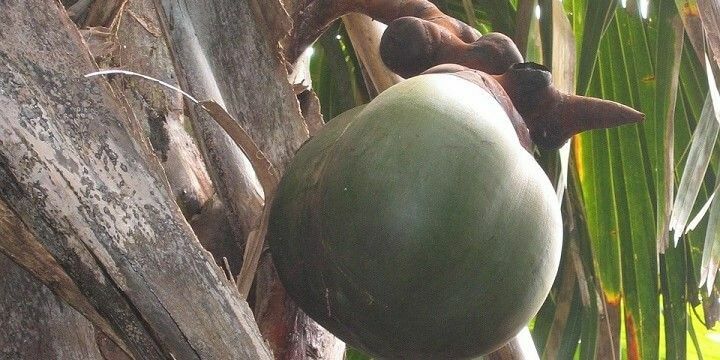 Coco de Mer is only found on Praslin Island and Curieuse Island. It’s so rare, in fact, that it’s only found on one other island: the neighboring Curieuse Island! To see as much of the park as possible, follow the Glacis Noire Trail, along which you might spot the endangered Seychelles black parrot. 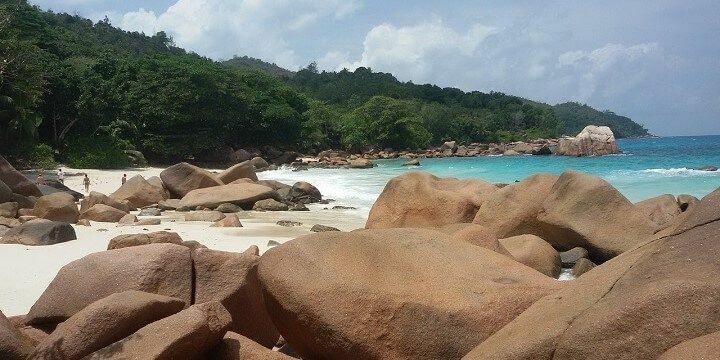 If you have extra time after exploring the Valée de Mai and some of Praslin’s beautiful beaches, such as Anse Lazio, take a day trip to Curieuse Island. Anse Lazio is located on Praslin Island. This tiny, three-square-kilometer island is best explored via the trail that will take you from Baie Laraie (the dock at which you will arrive) to Anse St. Joseph at the other side of the island. Along the way, you’ll see mangrove forests, huge granite cliffs, and giant Aldabra tortoises, which weigh over 250 kilograms. With almost no cars, La Digue is a great spot for a peaceful retreat. 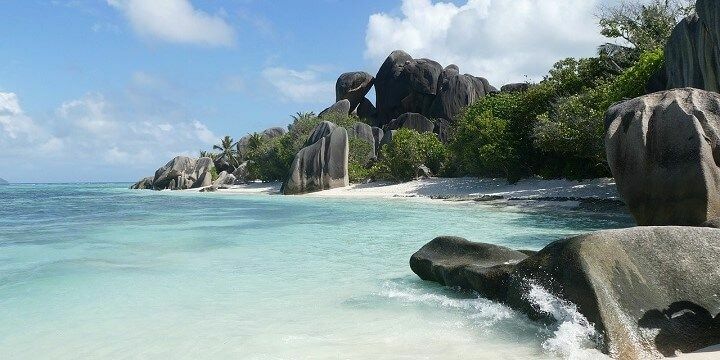 Don’t leave without visiting Anse Source D’Argent, one of the most-photographed beaches in the world. Although the beach is private, it’s worth paying the entrance fee to enjoy its beautiful white sand, clear turquoise water, and shady palm trees. Anse Source D’Argent is one of the world's most-photographed beaches. Looking for action rather than relaxation? Take to the calm waters in the North and West of the island, home to colorful reefs and an array of marine wildlife, making them great scuba diving spots. Alternatively, visit the main hub of the island, La Passe. Running from the North to the West, this is the best area for hotels, shops, and other services, if you need a bit of buzz after relaxing on La Digue’s beaches. If NextStop24 helped you to choose your next travel destination, we'd be very grateful if you’d search for your accommodation and things to do in the Seychelles through these links. They're affiliate links, which means that we will receive a small commission for every booking made through them. There are no extra costs for you; you'll simply be helping to keep NextStop24 running. Thanks! Seychelles is a beautiful country to visit filled with amazing nature - the beaches and sunsets provide stunning views. The white sandy beaches and crystal clear sea. Visiting during the rainy season.